Those who pass this northern town of Iloilo, especially visitors and tourists, often stop to look at the tasty looking mudfish displayed in kiosks along the road. Soon they find out that this is no ordinary mudfish. “People who taste our mudfish say there’s no other taste so delicious and desirable. They always come back for more,” said Mila Silvela, fishery technician of the Municipal Agriculture Office (MAO). Municipal Agriculturist Mervyn Porras said Zarraga town has been popular for its native pantat because of its wonderful taste and flavour. “It is preferred than other species, even if those other species introduced from Thailand, are bigger and take a shorter period to mature,” Porras said. He said the fishpond operators in Zarraga, about 37 of them, prefer to produce the native pantat as they call it as these are in demand in the market for its natural flavour even without any added condiments. Porras said the town’s history would always go back to the features of the well-known Sigangaw Creek where pantat (mudfish), turagsoy and gurami abound. Besides its own production, Zarraga is the meeting point for all other mudfish coming from the different towns in central and northern Iloilo, but nothing compares with the flavour of the town’s native mudfish, according to MAO. 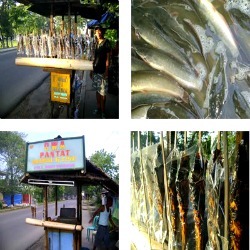 With the increasing demands for pantat in the last few years, Porras said the local government through his office, has organized and extended technical and financial assistance to mudfish operators as beneficiaries. These operators were trained under the supervision of the MAO to make the ponds suitable for the raising of the mudfish. Silvela, who directly supervises the operators, said pond preparation is crucial. Most of the ponds can found in backyards. "It begins with proper site selection, where the soil must be of clay, loamy texture, and the location not near the households to avoid bacteria contamination,” Silvela said. The soil is sun dried to the point of cracking, then lime is applied, followed by tea seed powder to kill predators that can hamper the growth of fingerlings. Silvela said the water source for the pond should be far from open canals, clean and not contaminated. She said that there are also specified numbers of fingerlings per square meter of the pond. For a square meter of a fishpond, five pieces fingerlings are placed, which means that if a beneficiary operates 100 square meters, 500 fingerlings are put into it. Nelida Octaviano’s family operates a 800-square meter mudfish pond with about 4,000 fingerlings. She said the fingerlings are carnivorous and are fed with chicken meat coupled with formulated feeds, fry booster and fry mash. “For every 1,000 fingerlings I spend about P5,000-P6,000 for a given period, with an estimated 70 percent survival,” Octaviano said. Silvela said that there should be close monitoring and keen observance of the feeding time to keep the fingerlings full. “Fingerlings must be fed four-five times a day,” Silvela said. She added that even if there is only 50 percent survival rate for fingerlings, the pond operator can still make a profit with a gate price of P100 per kilo, with two to three mudfish per kilo depending on the size. Mudfish production is year-round and the pond operator is never a loser, according to the MAO. “This is the time when all of us pond operators put together all our produce, display them in kiosks around the plaza at night, where visitors come purposely just to eat pantat prepared in variety of ways,” Octaviano said. Octaviano said in the past year, they were able to produce and dispose about five tons during the Pantatan Festival. “We were able to sell 100 kilos per kiosk per night, during the weeklong festival, Octaviano said. Meanwhile, the ordinary pantat is not ordinary for the people of Zarraga, as this has put them in the limelight, among food festivals in Iloilo. The “Pantat Festival” was a contender and big winner in the Aliwan Festival of festivals this year, as a tourism attraction.